This little chap is Sparkle, he is 3 1/2" tall and is very cute. 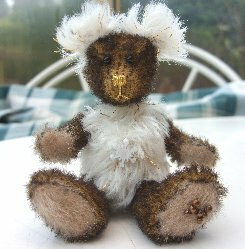 He is made of dark gold backed, very short matted brown South African mohair. As the fur is quite sparse, you can see the paler backing fabric through which is very effective. We have combined this with much longer, thicker tufted South African mohair in bright white with a gold metallic thread shot through. As he is made in such seasonal colours of white and gold, it seemed right to include him as part of our Christmas collection. He has a metallic gold thread stitched nose, shiny black English glass eyes and a pretty snowflake shaped belly button. Sparkle is steel shot filled and so quite heavy for his size. His pads and paws are made of pale gold textured Sassy fabric which glistens when it catches the light. He costs £35 plus postage, I hope you like him. Please note that as with all our bears, Sparkle is not a toy and is not suitable for children. Sorry - Sparkle has been adopted.